Almost exactly month ago, I lost the first Moleskine I ever bought at the local shopping mall. I was hoping beyond hope that my little sketchbook might somehow turn up under the seat of my car, or be returned by a mall-walker. I've now had to face the facts: my little sketchbook is long gone. Not coincidentally, my ink sketching has dropped off considerably ever since. I've found I like ink sketching because it's much riskier than pencil sketching. Once your pen hits the surface, you're committed to a sketch, baby. Bag: my kit is housed in my canvas Cafe Bag, which is a US Army surplus map case. It's small size and canvas construction make it light but tough. The Cafe Bag expands nicely to accommodate files, papers, books or other large items. Books: a 6x8 Miquelrius squared sketchbook, where I do my pencil-based logo and web sketch work. I love the flexible cover and larger size. For ink sketches and sketchtoons like the one above, I carry a Moleskine Pocket Sketchbook, with thick, smooth paper stock. Writing Instruments: I carry a Silver Pilot Dr. Grip Gel pen with 0.5 or in this case, 0.7 mm G2 Gel cartridge, or G2 plastic pen, and a FaberCastell E-Motion Pearwood mechanical pencil with 1.4 mm lead (thanks Fazal!). I especially like the thicker, softer HB lead for exploring shapes for logo design work I'm doing quite a bit of lately. Misc: I'll often carry a small clear triangle for straight lines and a set of oval and circle drawing templates for perfect circles/ovals. Sometimes I'll bring a dedicated eraser if I'm planning a long pencil sketching session. I would be interested in seeing/hearing how you make use of hte triangle and oval templates in your sketches. Doug, I mor often use the triangle when I need hard, stright lines in a sketch. I draw those kinds of lines when doing webpage design, to frame out the page in the Miquelrius. However, on the sketchtoon above, the stright lines at the top and bottom were created with the triangle. Oval and circle templates are much less used, though they do come in handy for times when I need a perfect circle either when doing logo work or again on web design sketches. yes!!!! another cafebag sketchtoon. don't know why i love these so much, but i do. sorry to hear about the loss of the moleskine, though. i've not seen that faber castell before ... nice! i may have to try that out one of these days ... of course, i'm still addicted to ridiculously sharp points on my pencils. Ender, the FaberCastell is very nice... but might dissapoint in the thick lead edition if you love sharp points on pencils. I'm not sure if FC offers a thinner 0.5 version, so you should check that before you buy. Love love love the sketchtoon! And can totally relate to what you said about prefering to sketch in ink. I am the same way. I tried to keep a sketchbook years ago, but forcing myself to work in pencil meant forcing myself to not consistently keep a sketchbook. Ever since buying my little moleskine and sketching in ink - I am seldom without my sketchbook and am capturing more and more of my daily life this way! Cori, thanks for the note! 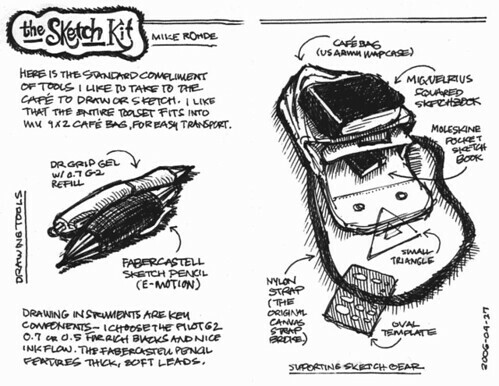 Great to hear you are keeping your sketch skills up with ink and a Moleskine.